If you don’t have a book code select your state and profession here. If your code isn't working, select state and profession here. 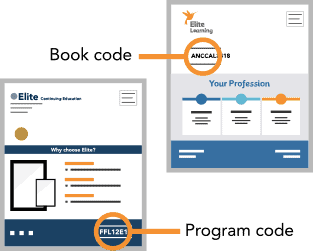 Thousands of licensed professionals trust Elite to provide the quality education they need with the simplicity and convenience they want. Elite courses have earned an average of 4.3 out of 5 stars from 2,741 reviews. Read more. Professionals across the country trust us to provide quality education while they can focus on the job at hand, and grow their skills along the way. The information was useful and much of it was new to me. This course was easy to read and understand. Contained a lot of helpful tips. Great data and statistics! I really enjoyed this course and look forward to learning more.